This is another "good" French unit. Its one of those units that's "fun", but if you're trying to squeeze maximum fire power out of your points, move on to a better unit. Similar cruisers in other Allied nations have better armor and/or vital. Most have slightly better guns, but only the Kent brings a flag rating to the table (but Kent lacks torps, while the Lamotte-Piquet is fairly stout in this category). If you're not looking for the flag bonus, any number of Allied cruisers (including Suffren) are better choices at similar cost. Scoutplane attack is a fairly cool little SA. Whether you think its useful or not, more or less decides whether the LP is a great or unremarkable unit. I'd recommend singling out a particularly annoying destroyer or torpedo boat and taking it out of the game early (hopefully). IMHO, I'd pass on this unit and invest the points towards a better cruiser or a more cost effective destroyer. Agreed, another "good" French unit. Whether it is worth the 12 points depends on how to intend to use it. It has three good things going for it. 1) Flag 1 2) Scoutplane Attack and 3) 2x torps out to range 2. Guns are not the best and AA is not up to cruiser "standards" but she still has her uses. Flag 1 can be a help to you or not depending on your style and preference. Scoutplane Attack can be strong as you can place the "scout planes" before placing your actual aircraft to see what your opponent is going to do. 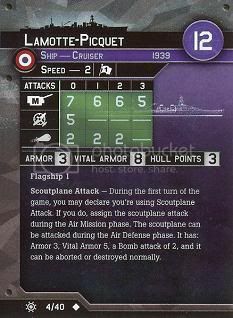 These scout planes can damage or sink opponents destroyers or MTB's but are useless against anything much bigger. The torps are strong with 2 out to range 2. Use these in tandem with Milans. Use Chase to move the Milans out front and pop smoke to protect your Lamottes. Use the Lamotte gunnery against MTB's, DD's, and other cruisers and use the torps for BB's. It is a make or break tactic but the French fleet seems to either win big or fail on an epic scale. Either way have fun with it. I am trying to find some redeeming quality about it but have failed. Two bombs - seriously? For a second there I thought we were playing a WWI game. Mini has some nice detail but is over-sized as it is almost as big as Suffren. The paint is very blah but a little touch up goes a long way.